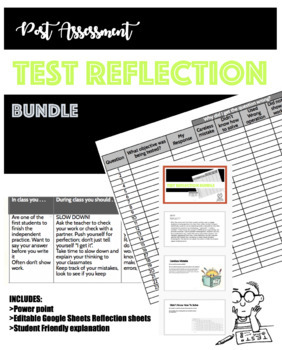 Why reflect after a big test? After the assessment has been scored, another way to engage students in metacognition is to have them reflect on their answers. Specifically, students can be asked to provide a rationale for why they answered the question incorrectly (e.g., “I guessed”, “I made a mistake”, “I don’t know the concept”). While (most importantly), this provides students a way to practice metacognition, teachers can also be provided with very useful information about their students. For example, aggregated over time, these reflections can tell a teacher whether the student has a tendency to make simple mistakes. Knowing this, the teacher can adjust instruction or help the student adjust studying tactics.